I have spent a lot of time in the field this weekend. I am sad to report that an adult female was found dead beneath her nest, both chicks gone. This is most likely the work of a Great Horned Owl. I also attended a few bandings of lovely, healthy four week old chicks. Very good to see. I am also still counting heads on the nests and was at one today where I was watching a big strong 3.5-4 week, old chick being fed. I was wondering why they only had one chick and then another popped up and I gasped audibly because it was so small compared to the other. We know that eggs can be laid about 3 days apart and if the middle egg did not hatch, these two could be almost six days apart in age. But the size difference seemed larger than that. I also know some cams have shown eggs laid even further apart than that, perhaps due to some kind of disruption on the nest. The little guy did get fed tho....so I will just keep watching to see what happens. This is the time of year when chicks can die, runts that don't get enough food, larger chicks getting blown out of the nest, or being predated. I have tried to count heads early so we can document the losses. I know some people just count chicks once and that is their final tally. But I try to count them early and then keep track as they approach fledging age and beyond, to see how these numbers change. I am always so darn curious about everything. The mortality rate is important too. Oddly enough, this year some nests that have historically been very successful, have failed....and some that have either failed in the past or have typically produced small broods, have three chicks on them! They like to keep us guessing! In some cases it is because there is one different adult on the nest, and the hormonal mix is different! I had an exciting morning online talking with a bunch of osprey researchers and serious enthusiasts from all over the world about various different situations and behaviors...so great to meet new people and talk shop, so to speak, about the passion we share for learning about these birds! Thanks Tiger, for hooking me up! Even tho I got a very late start on nest checking because of it! I have also run into some great people in the field who are so interested in these birds and what I am doing...love meeting them and talking about these birds, letting them look thru my scope. Now it is pouring rain...got home just in time. News from the Mare Island Osprey Festival! A little happy update tonight....Today I visited the new nest of female 3S, who had nested unsuccessfully at the Arboretum Cam Nest the last few years. I am pleased to announce that she has three beautiful chicks with her new mate. She went thru so much this spring, waiting for 79, trying to find a mate....and after her only chick died last year, it was a joyful moment to watch three little heads popping up for a feeding this morning. The male she is with also had two chicks who died last year, so we are happy for him too. Of course they still have a long ways to go, but three chicks have survived the first few weeks. They are off to a very good start as a new pair. I also found four more nests had failed in the past week or so. I was happy to find one pair, whose nest had failed earlier, was sitting side by side on the nest perch. Knowing the adults are alive and still remain in their territory together, bodes well for next year. The number of failures so far is still in the realm of normal. We have been so busy checking nests, still reading bands and counting heads. Sadly we are also documenting a number of failed nests. It's so sad when one week you are happily watching hem feeding chicks and the next week, everyone is gone, or you can only find one or both adults. Many times I do not know the cause of the failure. Of course chicks do die of natural causes, and they are also predated, most commonly by Great Horned Owls. If I find both adults alive it lessens the sadness as they will get another chance next year. 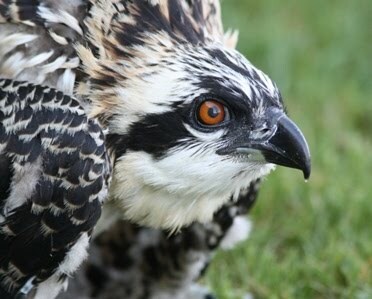 Ospreys are a fairly long lived bird and we can expect some breeding failures in their lifetime. It is much sadder to me when a breeding adult dies. So I am searching for some missing adults, hoping they are still alive. So much happening, I could write a book. First of all some sad news. I found out what happened to our 23 year old friend Mr 79, the long time male on the Arboretum nest (with the cam). He did end up at The Raptor Center the day after I last saw him in April. He was in pretty bad shape...he was admitted on 4/24/15 with an old projectile wound in his neck, a large necrotic wound on his left wing near his elbow, and permanent damage to his left eye. He was also in a state of starvation and could not be saved. He is free now and his genes will live on his offspring. I loved knowing him for all those years. He must have survived many difficult experiences to get back to his home that one last time. I shed a tear as I write this. It's hard to explain what it's like to observe these birds for so many years, and then to lose them. It's the way of things, and he had a terrific, long life...but still knowing that he encountered some awful experiences that would cause a projectile wound in his neck, makes me wonder about this world. On a happier note, his former mate, Ms 3S, who moved to a new nest with a new male, has successfully hatched some eggs and I watched her feeding the wee ones, still not visible, this morning. I checked many nests today and on at least four of them I found males feeding females and chicks! So sweet. I have been able to count the chicks heads on many more nests now, so we are starting to get an idea of the size of the class of 2015! Only one nest today had three chicks, most had two, tho the chicks are so young that there certainly could be more wee ones in there! Many chicks are just still too young to be seen. I have begun seeing my first chicks! They usually can't be seen for about ten days if you are watching from the ground. It is so thrilling when you can start counting heads during a feeding. I watched one nest today where the male was doing the feeding of two little guys....who were spending a lot of time establishing the "pecking order". Literally. Pecking at each other, motoring around the nest a bit. Mom sat on the sidelines and watched, and quietly food begged. The pecking phase seems to pass and feeding times become more harmonious on many nests, when seniority is clear and fish are abundant. It is so exciting when we get to start counting heads. I like to do it as soon as possible and then keep counting as the season goes on, so we can document the mortalities. Inevitably, some little guys don't survive. We continue to monitor and count heads until after fledging, to make this productivity study as accurate as possible. Many chicks die between now and fledging and numbers can become quite inflated if nests are not checked throughout the season. The mortality rate was somewhat high last year, so we are paying close attention to outcomes.